The surgical repair of inguinal hernia and hydrocele is one of the most common operations performed in pediatric surgery practice. In particular, inguinal hernia is a commonly encountered condition in neonates and premature infants. Open herniotomy has always been the standard procedure for this group of patients over the years. With the advent of minimally invasive surgery (MIS), laparoscopic repair has been introduced as a viable alternative to open inguinal repair; however, its use in neonates and premature babies is still limited. The authors describe the principles of diagnostic assessment, timing for surgery, anesthetic management, and specific anesthetic risks of neonates and premature infants undergoing inguinal hernia repair underlying the differences between inguinal approach and minimally invasive surgery (MIS). 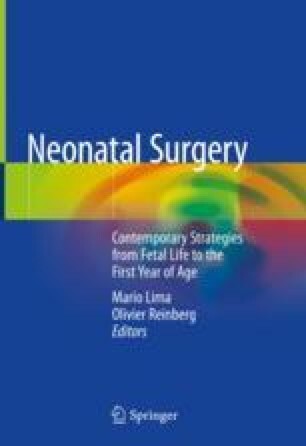 The authors also report a comparative outcome analysis between open and laparoscopic inguinal hernia repair in neonates and premature infants, by evaluating the following parameters: hernia recurrence, postoperative complications (testicular atrophy, wound infection, iatrogenic cryptorchidism), contralateral patency of peritoneal vaginal duct, and metachronous hernia. Other discussed points are the current management of incarcerated hernias, recurrent hernias, and other rare hernias in this patient population. Finally, the authors discuss the role of laparoscopy in the surgical treatment of inguinal hernia and hydrocele underlying that the current use of MIS has completely changed the management of inguinal hernia also in neonates and premature infants.